When a woman named Rose is attacked in the woods and raped, she makes it her mission to track down her assailants one by one and get violent revenge. After killing one of them, she’s on the run from the law, mainly represented by Interpol agents Donald (Baron) and George (Lam), though she and George continue to see each other on the sly. But the Interpol agents are also interested in these dastardly characters because they just so happen to be a gang of international diamond smugglers. Aren’t they all. Presumably this is where Richard Harrison, playing a guy named Richard, comes into the picture and some warring ninjas face off in acrobatic duels, but it’s hard to tell. Will Rose get her revenge? And what are all these ninjas doing here? Find out today...? By Godfrey Ho standards, this particular outing is relatively straightforward. By any other standard of moviemaking, it’s still a silly, nonsensical oddity, but what we have here is more or less a revenge drama with a couple of spliced-in ninja moments. 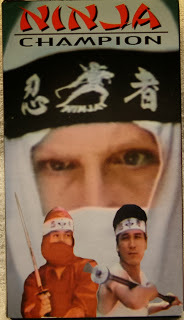 Maybe Ho and the gang injected the ninjas simply because it was the Ninja Boom of the 80’s and in order to get your movie in video stores, it had to have the word “ninja” in the title somewhere. 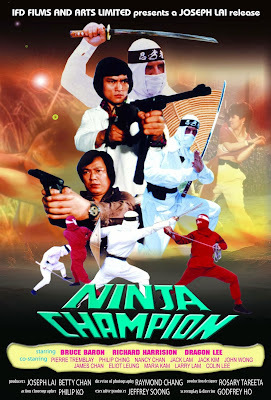 And being the honest man that he is, he wouldn’t give the public a movie called Ninja Champion and deprive it of ninjas. (Though to get really specific, it’s not exactly clear who the “champion” refers to, but that’s neither here nor there.) The movie would have worked just as well without said ninjas, however, and as a revenge drama it more or less works, if Godfrey Ho’s style means anything to you. Of course, the loud, abrasive dubbing is here, but to counteract that the clothes the characters wear and the home decor are truly something to behold, as they usually are in Mr. Ho’s works. While George is an “Interpol agent with a license to kill”, and Bruce Baron, who has had an interesting career in low budget movies, is there to back him up (though he does look a lot like Richard Harrison, so his casting adds yet more unnecessary confusion to the proceedings), and of course Harrison is here, from some other movie no doubt, but the most welcome re-appearance is the Garfield phone (first seen in Diamond Ninja Force). It’s back! Fans must have demanded it, and it was nice to see. Then a guy in a Michael Jackson jacket fights a guy with a bowtie wielding a sword. Or, as an abbreviation, MJ Jacket vs. Bowtie Sword. And including the aforementioned Baron and Harrison, the whole movie is a cavalcade of admirable mustaches. The baddies wear very weird clown makeup at random times, and of course our ninjas wear headbands that say “ninja” on them. Naturally, it all ends up at an abandoned warehouse, and by Ho standards the ending isn’t even that abrupt. So if you know and love the nutty cinematic stylings of Mr. Ho, here you will get what you’re used to. Others will probably be confused, but likely still reasonably entertained.